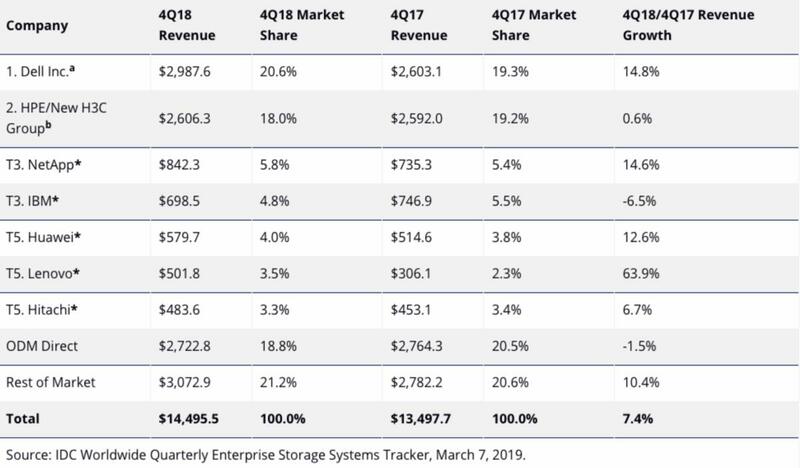 NetApp has edged ahead of IBM in the enterprise storage systems market, moving into third place behind leaders Dell and Hewlett Packard Enterprise. The vendor - which generated a 5.8 per cent share of total revenue during the fourth quarter of 2018 - made slight advances on IBM, which captured 4.8 per cent market share during the same period. While statistically tied according to IDC findings, due to a difference of less than one per cent, the figures are encouraging for NetApp in light of a revenue increase of more than US$100 million compared to the same period in 2017, at a growth rate of 14.6 per cent. Meanwhile, Big Blue dropped around US$50 million in global revenue during the quarter, at a swing of -6.5 per cent. Unsurprisingly, Dell remained the largest supplier for the quarter, accounting for 20.6 per cent of total worldwide enterprise storage systems revenue and growing 14.8 per cent year over year. HPE ranked second with 18 per cent share of revenue on year-to-year growth of 0.6 per cent, while the number five position was shared between Huawei, Lenovo and Hitachi, with shares of four per cent, 3.5 per cent and 3.3 per cent respectively. More broadly speaking, and according to IDC research, vendor revenue in the worldwide enterprise storage systems market increased 7.4 per cent year over year to US$14.5 billion during the quarter. Specifically, total capacity shipments were up 1.7 per cent year-over-year to 92.5 exabytes during the quarter. Meanwhile, revenue generated by the group of original design manufacturers (ODMs) selling directly to hyper-scale data centres declined 1.5 per cent year-over-year to US$2.7 billion - this represents 18.8 per cent of total enterprise storage investments during the quarter. “The fourth quarter results represent a slight shift from trends realised during the first three quarters of 2018, most notably the revenue decline for the ODM group of vendors as cloud providers slow their investment due to significant existing capacity," said Sebastian Lagana, research manager at IDC. “That considered, OEM vendors selling dedicated storage arrays are addressing demand from businesses investing in both on-premises and public cloud infrastructure. Lagana said sales of server-based storage increased 4.7 per cent year over year to just under US$4.1 billion in revenue, accounting for 28.1 per cent of total enterprise storage investments. Furthermore, the external storage systems market was worth roughly US$7.7 billion during the quarter, up 12.5 per cent during the same period in 2017.